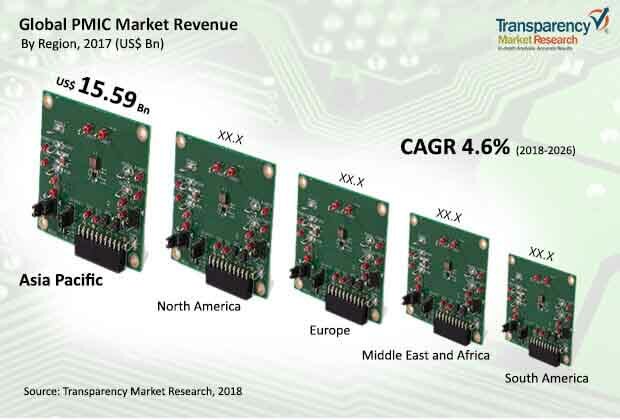 According to a new market report pertaining to the power management integrated circuit (PMIC) market, published by Transparency Market Research, the global PMIC market is expected to reach US$ 56.48 Bn by 2026, expanding at a CAGR of 4.6% from 2018 to 2026. According to the report, the global market will continue to be influenced by a range of macroeconomic and industry-specific factors. Asia Pacific will continue to be at the forefront of global demand, with the market in the region growing at a CAGR of 5.5% through 2026. High smartphone penetration in the last few years has made smartphones and other smart mobile devices very common in the developing and developed countries. Furthermore, 4G internet services have also become reasonable and widely available to smartphone users globally. PMICs are employed for simplification of design and extending battery life in smartphones and other smart portable devices. Therefore, the rising trend of smartphones and other smart devices is estimated to be directly proportional to the expansion of the PMIC market. The global PMIC market is broadly segmented by product type and end use. By product type, the market is classified into voltage regulators, motor control IC, integrated ASSP power management IC, battery management IC, microprocessor supervisory IC and others. Demand for voltage regulators is increasing in automotive, consumer electronics, industry, telecom & networking and other segments as these ICs help to increase the battery life of handheld devices such as smartphones, tablets, and laptops. Therefore, they are expected to consistently dominate the power management IC market during the forecast period. Apart from voltage regulators, integrated ASSP power management IC and battery management ICs are also expected to represent considerable market share to the PMIC market during the forecast period. Furthermore, based on end use, consumer electronics followed by automotive represented the largest share in 2017, and are further expected to maintain their position throughout the forecast period. In the consumer electronics sector, the market for PMIC is primarily driven by rise in global sale of smartphones, tablets, laptops, PCs, and other consumer electronic devices. Also, better power management, functionality, and features of PMICs have enormously increased its usage in the automotive end use segment. Consumer electronics and automotive are collectively expected to account for ~60% of the global PMIC market in 2026. Asia Pacific dominates the global power management IC market in terms of revenue owing to the rising demand for smartphones and other handheld devices. Asia Pacific is a hub of automobile production such as cars, trucks, heavy utility vehicles, and hybrid vehicles which is another factor accountable for high growth of the region. With the region being an epicenter for consumer electronics manufacturing and automobile companies, large-scale production of PMIC is expected to represent the highest market share of Asia Pacific in the global power management IC market. Along with market share, the market in Asia Pacific is anticipated to witness highest growth as compared to other regions. Furthermore, countries in Asia Pacific such as China, India, and Japan are expected to drive the growth mainly due to the rapid technology developments in these regions.The PMIC market in North America and Europe have high growth prospects in automotive, consumer electronics, and industrial applications. They are collectively expected to represent ~45% revenue share in 2026, by growing at a steady CAGR during the forecast period. The research study includes profiles of leading companies operating in the global PMIC market. Analog Devices, Inc., STMicroelectronics N.V., Mitsubishi Electric Corp, Renesas Electronics Corporation, Texas Instruments, Inc., Linear Technology Corporation, Maxim Integrated Products, Inc., ON Semiconductor Corporation, Rohm Co., Ltd., Toshiba Corporation, and Semtech Corporation among others are the leading companies in the market. Companies are focusing on expanding their business through product development and partnerships with several end-use industries.